The goal of my research is understanding the mechanisms that underlie the ability of the nervous system to generate flexibility in patterned movements. Many activities, such as breathing and locomotion, require repeated patterns of movement. These rhythmic movements are controlled by neural circuits that are "hard-wired", but are nonetheless able to generate multiple outputs, thereby allowing the same network to control multiple versions of a behavior, for example, running and walking. My lab uses two simple neural circuits in the lobster as a model system in which to examine the physiological and molecular mechanisms that drive this flexibility. We use a range of techniques, including physiological recordings of neuronal activity, recordings of heart contractions, immunohistochemistry, and some molecular techniques. Dickinson PS, Armstrong MK, Dickinson ES, Fernandez R, Miller A, Pong S, Powers B, Pupo Wiss A, Stanhope ME, Walsh PJ, Wiwatpanit T, Christie AE. (2018). Three members of a peptide family are differentially distributed and elicit differential state-dependent responses in a pattern generator-effector system. J Neurophysiol.119:1767-1781. Christie AE, Miller A, Fernandez R, Dickinson ES, Jordan A, Kohn J, Youn MC, and Dickinson PS. (2018). Non-amidated and amidated members of the C-type allatostatin (AST-C) family are differentially distributed in the stomatogastric nervous system of the American lobster, Homarus americanus. Invertebrate Neuroscience 18: 2. Christie AE, Roncalli V, Cieslak MC, Pascual MG, Yu A, Lameyer TJ, Stanhope ME, Dickinson PS. (2017). Prediction of a neuropeptidome for the eyestalk ganglia of the lobster Homarus americanus using a tissue-specific de novo assembled transcriptome. Gen Comp Endocrinol. 243:96-119. Dickinson PS, Qu,X, Stanhope, M. (2016). Neuropeptide modulation of pattern-generating systems in crustaceans: Comparative studies and approaches. Current Opinion in Neurobiology 41:149-157. Dickinson, ES, AS Johnson, O Ellers, PS Dickinson. (2016). Forces generated during stretch in the heart of the lobster Homarus americanus are anisotropic and are altered by neuromodulators. J Exp Biol. 219:1187-202. Dickinson PS, Calkins A and Stevens JS. (2015). Related neuropeptides use different balances of unitary mechanisms to modulate the cardiac neuromuscular system in the American lobster, Homarus americanus. J. Neurophysiology 113(3):856-70. Williams AH, Calkins A, O'Leary T, Symonds R, Marder E, Dickinson PS. 2013. The neuromuscular transform of the lobster cardiac system explains the opposing effects of a neuromodulator on muscle output. J Neurosci 33(42):16565-75. Stemmler EA, Barton EE, Esonu OK, Polasky DA, Onderko LL, Bergeron AB, Christie AE, Dickinson PS. (2013). C-terminal methylation of truncated neuropeptides: an enzyme-assisted extraction artifact involving methanol. Peptides 46:108-25. Williams, AH, Kwiatkowski, MA, Mortimer, AL, Marder, E, Zeeman, ML and Dickinson, PS. (2013). Animal-to-animal variability in the phasing of the crustacean cardiac motor pattern: an experimental and computational analysis. J. Neurophysiology 109:2451-2465. Kwiatkowski, MA, Gabranski, ER, Huber, KE, Chapline, MC, Christie, AE and Dickinson, PS. (2013). Coordination of distinct but interacting rhythmic motor programs by a modulatory projection neuron using different co-transmitters in different ganglia. Journal of Experimental Biology 216:1827-1836. Wiwatpanit, T, Powers, B, and Dickinson, PS. (2012). Inter-animal variability in the effects of C-type allatostatin on the cardiac neuromuscular system in the lobster Homarus americanus. Journal of Experimental Biology, 215:2308-2318. Christie AE, Stemmler EA, Dickinson PS (2010). Crustacean neuropeptides. Cell Mol Life Sci. 67(24): 4135-69. Christie, AE, *JS Stevens, *MR Bowers, MC Chapline, DA Jensen, K Schregg, *J Goldwaser, *MA Kwiatkowski, *TK Pleasant Jr, *L Shoenfeld, *LK Tempest, *CR Williams, *T Wiwatpanit, *ER Gabranski, CM Smith, KM Beale, DW Towle, DA Schooley and PS Dickinson (2010). Identification of a calcitonin-like diuretic hormone that functions as an intrinsic modulator of the American lobster, Homarus americanus, cardiac neuromuscular system. Journal of Experimental Biology 213, 118-127. *Stevens, JS., *CR. Cashman, CM. Smith, KM, Beale, DW. Towle, AE. Christie and PS. Dickinson (2009). The peptide hormone pQDLDHVFLRFamide (crustacean myosuppressin) modulates the Homarus americanus cardiac neuromuscular system at multiple sites. Journal of Experimental Biology. 212: 3961-76. Stemmler, E.A., *Bruns, E.A., *Cashman, C.R., Dickinson, P.S., Christie, AE. (2009). Molecular and mass spectral identification of the broadly conserved decapod crustacean neuropeptide pQIRYHQCYFNPISCF: The first PISCF-allatostatin (Manduca sexta- or C-type allatostatin) from a non-insect. Gen Comp Endocrinol. 165(1):1-10. Dickinson, P.S., *T. Wiwatpanit, *E.R. Gabranski, *R.J. Ackerman, *J.S. Stevens, *C.R. Cashman, E.A. Stemmler, and A.E. Christie. (2009). Identification of SYWKQCAFNAVSCFamide: a broadly conserved crustacean C-type allatostatin-like peptide with both neuromodulatory and cardioactive properties. Journal of Experimental Biology. 212:1140-52. Dickinson, P.S. *E.E. Barton, E.A. Stemmler, *C.R. Cashman, *N.P. Gardner, *S. Rus, *H.R. Brennan, T.S. McClintock and A.E. Christie. (2009). Molecular, mass spectral, and physiological analyses of orcokinins and orcokinin precursor-related peptides in the lobster Homarus americanus and the crayfish Procambarus clarkii. Peptides: 30:297-317. Christie, A.E., *C.R. Cashman, *J.S. Stevens, C.M. Smith, K.M. Beale, E.A. Stemmler, S.J. Greenwood, D.W. Towle, P.S. Dickinson. (2008). Identification and cardiotropic actions of brain/gut-derived tachykinin-related peptides (TRPs) from the American lobster Homarus americanus. Peptides, 29: 1909-18. Dickinson, P.S., E.A. Stemmler, *C.R. Cashman, *H.R. Brennan, *R.J. Dennison, *K.E. Huber, *B. Peguero, *W. Rabacal, C.C. Goiney, C.M. Smith, D.W. Towle and A.E. Christie. (2008). SIFamide peptides in clawed lobsters and freshwater crayfish (Crustacea, Decapoda, Astacidea): a combined molecular, mass spectrometric and electrophysiological investigation. General and Comparative Endocrinology, 156:347-360. *Stevens, J.S., A.E. Christie, P.S. Dickinson. (2008). Complex modulation of Homarus americanus cardiac activity by the peptide hormone TNRNFLRFamide. MDIBL Bulletin 47: 82-85. Dickinson, P.S., Stemmler, E.A., Christie, A.E. (2008). The pyloric neural circuit of the herbivorous crab Pugettia producta shows limited sensitivity to a number of neuromodulators that elicit robust effects in more opportunistically feeding decapods. J. Exp. Biol. 211:1434-47. Thompson, R.R., Dickinson, P.S., Rose, J.D.1, *Dakin, K.A., *Civiello, G.M., *Segerdahl, A., and *Bartlett, R. (2008). Pheromones enhance somatosensory processing in newt brains through a vasotocin-dependent mechanism. Proc Roy Soc B, 275(1643):1685-93. Hsu, Y.W., Stemmler, E.A., Messinger, D.I., Dickinson, P.S., Christie, A.E., de la Iglesia, H.O. (2008). Cloning and differential expression of two beta-pigment-dispersing hormone (beta-PDH) isoforms in the crab Cancer productus: Evidence for authentic beta-PDH as a local neurotransmitter and beta-PDH II as a humoral factor. J. Comp Neurol. 508(2):197-211. Stemmler, E.A., Y.A. Hsu, *C.R. Cashman, D.I. Messigner, H.O. de la Iglesia, P.S. Dickinson and A.E. Christie. (2007). Direct tissue MALDI-FTMS profiling of individual Cancer productus sinus glands reveals that one of three distinct combinations of crustacean hyperglycemic hormone precursor-related peptide (CPRP) isoforms are present in individual crabs. General and Comparative Endocrinology 154: 187-192. Stemmler, Elizabeth A., *Emily A. Bruns, *Noah P. Gardner, Patsy S. Dickinson and Andrew E. Christie, (2007). Mass spectrometric identification of pEGFYSQRYamide: a crustacean peptide hormone possessing a vertebrate neuropeptide Y (NPY)-like carboxy-terminus. General and Comparative Endocrinology 152:1-7. Christie, Andrew E., *Szymon Rus, Christopher C. Goiney, Christine M. Smith, David W. Towle and Patsy S. Dickinson (2007). Identification and characterization of a cDNA encoding a crustin-like, putative antibacterial protein from the American lobster Homarus americanus. Molecular Immunology 44:3333-3337. 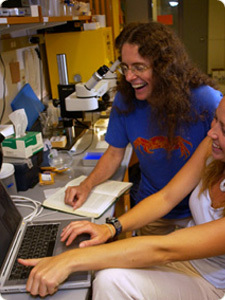 Christie, Andrew E., Kimberly K. Kutz-Naber, Elizabeth A. Stemmler, Alexandra Klein, Daniel I. Messinger, Christopher C. Goiney, *Anna J. Conterato, *Emily A. Bruns, Yun-Wei A. Hsu, Lingjun Li and Patsy S. Dickinson (2007). Midgut epithelial endocrine cells are a rich source of the neuropeptides APSGFLGMRamide (Cancer borealis tachykinin-related peptide Ia) and FYRKPPFNGSIFamide (Gly1 - SiIFamide) in the crabs Cancer borealis, Cancer magister and Cancer productus. Journal of Exp Biol. 210:699-714. Elizabeth A. Stemmler, *Braulio Peguero, *Emily A. Bruns, Patsy S. Dickinson and Andrew E. Christie (2007). Identification, physiological actions, and distribution of TPSGFLGMRamide: a novel tachykinin-related peptide from the midgut and stomatogastric nervous system of Cancer crabs. Journal of Neurochemistry, 101:1351-1366. Dickinson, P.S. (2006). Neuromodulation of central pattern generators in invertebrates and vertebrates. Current Opinion in Neurobiol. 16:604-614. Stemmler, E.A. *Gardner, N.P. *Guiney, M.E., *Bruns, E.A., Dickinson, P.S. (2006). The detection of red pigment concentrating hormone (RPCH) in crustacean eyestalk tissues using Matrix Assisted Laser Desorrption/Ionization-Fourier Transform Mass Spectrometry: [M+Na] ion formation in dried droplet tissue preparations. J. Mass Spectrometry, 41:295-311. Christie, A.E., Stemmler, E.A., *Peguero, B., Messinger, D.I., *Provencher, H.L., *Scheerlinck, P., Hsu, Y.-W.A., *Guiney, M., de la Iglesia, H., and Dickinson, P.S. (2006). Identification, Physiological Actions and Distribution of VYRKPPFNGSIFamide (Val1-SIFamide in the Stomatogastric Nervous System of the American Lobster Homarus americanus. J. Comp. Neurol. 49:406-21. Zamer, William E. and Patsy S. Dickinson (2005). Skill Building: Peer Review, in Integrate: Laboratory Manual for Physiology: A Benjamin Cummings Custom Edition, edited by Dee U. Silverthorn, Bruce R. Johnson, Alice C. Mills. Stemmler, E.A., *Provencher, H.L., *Guiney, M.E., *Gardner, N.P., and Dickinson, P.S. (2005). Matrix Assisted Laser Desorption/Ionization-Fourier Transform Mass Spectrometry for the identification of orcokinin neuropeptides in crustaceans using metastable decay and Sustained Off-Resonance Irradiation. Analytical Chemistry. 77 (11):3594-606. Alexandra Miller (2018) Does a central pattern generating system's modulatory ability underlie its behavioral diversity?